Today, Albertson's grocery store had this darling silicone salad dressing bottle hanging on a rack by the refridgerated salad dressings. It's squeezable, with a screw-on flip top. 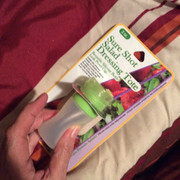 Also, instead of just having a small hole where the salad dressing comes out, it has a small, soft, silicone "valve" (a little "x" is cut in the middle of the silicone). "Unique valve prevents splatter." It holds two ounces. 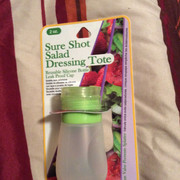 I fell in love with the Sure Shot Salad Dressing Tote at first sight, and I bought two of them. Not cheap though. About $4 each, and apparently higher on the internet. I'm thinking that if I like them, I might get another one for my homemade toothpaste. Hope I never get confused and put homemade peppermint toothpaste on my salad. They come in sets of 3 on Amazon, and have varying capacities. They started out as being toiletry thingies and quickly got adopted for all sorts of stuff. The ones I have are called go toobs and they can in time of crisis be converted to water guns. I love them. They never ever leak and they don’t carry smells. I've wanted to try out some of those cute Keurig coffees for quite a while now. Today I got this highly economical Presto My Jo (about $20 at Albertson's, but about $15 online). 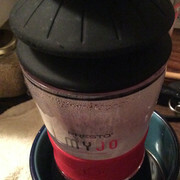 The Presto My Jo only makes one cup at a time, and you have to either boil some water the old fashoin way or else you can use a microwave. 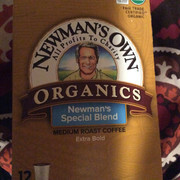 I bought Newman's Own Organics Special Blend, Keurig Hot. Delicious! 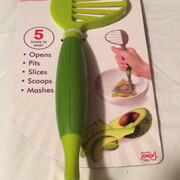 I found the perfect potato masher for my one-person size portion of fresh mashed potatoes! 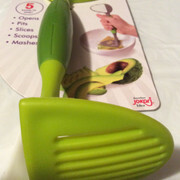 It's designed to be a masher for guacamole. But I just got through using it to mash five small red potatoes in a small round pyrex dish. Potatoes, butter, and himalayan salt. After mashing them, I put sour cream on top. I'm just so happy to have found a potato masher that's not proportioned for making mashed potatoes for a full table of people. 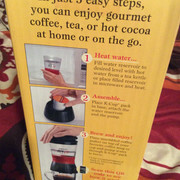 An update on the Presto MyJo coffee maker...Lol. I can hardly write this without starting to laugh. 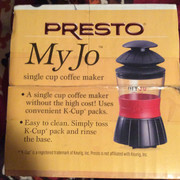 I am keeping the Presto MyJo coffee maker. It is not a rip-off. BUT,...have you ever played an accordian? I have. And believe me,...that little pump up on top of this coffee maker isn't just there for decoration, nor for a gentle encouragement to move the coffee on down into the coffee grounds and into your cup. Nope. That pump is there to give your arm a workout like your physical therapist hadn't even thought up for you yet. 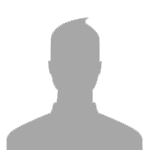 I hadn't worked so hard since playing accordian for my religious meetings. I will probably make a judiciously small extra cut in the silicon valve so that coffee can flow down faster and easier. I made tiny cuts in the silicon valve, so now I don't have to pump so hard to get the water/coffee to move through the grounds. But, by the time the coffee gets to the cup, it isn't hot enough for me. So, then I have to re-heat it. This is too much trouble.